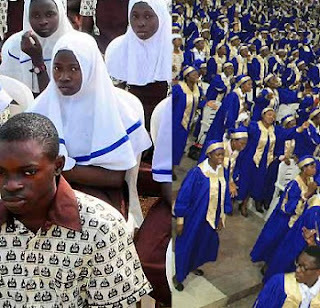 Osun State chapter of the Christian Association of Nigeria, CAN, has stated that Christians in the state public schools would start wearing church garments to school if Governor Rauf Aregbesola goes ahead to implement to recent State High judgment on wearing of hijab by Muslim students. This statement was made through a communiqué issued and signed by the state CAN chairman, Rev. Elisha Ogundiya, at the end of an emergency meeting of the state CAN Executive Committee, heads of blocks and heads of churches held in Osogbo on Tuesday, June 7, 2016. According to him, the meeting deliberated on the outcome of the hijab case with particular reference to the June 3, 2016, judgment of Justice Saka Oyejide Falola of the Osun State High Court sitting at Court No. 5, Osogbo, and resolved on a number of issues. “OS-CAN states that it finds itself unable to agree with the judgement in its entirety as we have reasons to believe that it represents a study in premeditated adjudication that runs against the printed grain of legal submissions made before him. We have unanimously decided to appeal the judgement. “Further, Justice Saka Oyejide Falola made an ancillary order which was not based, anchored or premised on any submission or prayer canvassed by the parties before him that by saying by way of ancillary order, the Muslim female students hijab shall be in the colour and design already approved by the first-third respondents and currently in use by Muslim female students in public schools or any other design recommended by the first-third respondents. “We maintain that since none of the parties in the case canvassed for such order, he went out of the processes to descend into the arena to suit the desire of his fellow religious faithful. It is, for now, better left to the imagination where Justice Saka Oyejide Falola came by this detail extraneous to the filed processes in the suit. “That the judgement read severally that hijab is a means of propagation of Islam which he said is a fundamental right of Muslim girls and ladies. This declaration violates the religious right of the original owners of the missionary schools as agreed upon when the schools were taken over by the then government of Oyo State in 1975. “That the government be wary about giving effect to this judgement which we suspect was masterminded by Ogbeni Rauf Aregbesola a la work-to-rule mode in line with his Islamization Agenda which was earlier stated by the Directorate of Military Intelligence in 2012 based on credible intelligence and corroborated by OS-CAN in 2014. This unshed toga of Ogbeni Rauf Aregbesola flies in the face of the fact of the overwhelming number of Christians in Osun State vis-a-vis Muslims. “We urge all Christians in Osun State to be law abiding and live peacefully as we have always done with our neighbours, irrespective of their religious inclinations, while we seek to employ all legitimate means to resist any form of Islamisation of our beloved state where, incidentally, Christians constitute the larger number. “While the Osun State government is inclined to implementing the judgement, Christian students in all public schools founded by Christians with the toil and sweat of our forefathers in the faith will have no choice but to start wearing Christian garments and vestments as part of their school uniform for the propagation of our own faith, given the Justice Saka Oyejide Falola declared right of Muslim female students to do same as what is sauce for the goose is sauce for the gander as well. CAN called on all men and women of goodwill, Muslims and Christians, the presidency, National Assembly and the international community to intervene in this situation before it escalates beyond control.